Since the time my article on USRPT was published in “Swimming World” in 2015, the “mystery” around the USRPT method has not disappeared, leading to even more questions about its validity and effectiveness. The “evidence” claimed by USRPT founder is also not that obvious since the results among USRPT adopters are mixed and sketchy. The issues with USRPT method pointed out in my original article still remain unanswered. The reviews coming from the professional community and leading sports scientists are hardly favorable either, with most leading sports physiologists disagreeing with USRPT’s approach in general and warning potential users of the very probable negative long-term effects of the program. The latest direction the USRPT founder is taking focuses on validating USRPT’s application to shorter distances, predominantly 50 and 100 meters/yards (“Sprint USRPT”). The new manuals that appeared on the USRPT site are very generic in nature, and offer banalities as a breakthrough in training science, none of which changes anything in USRPT’s concept or provides any answers to questions raised in my original article. 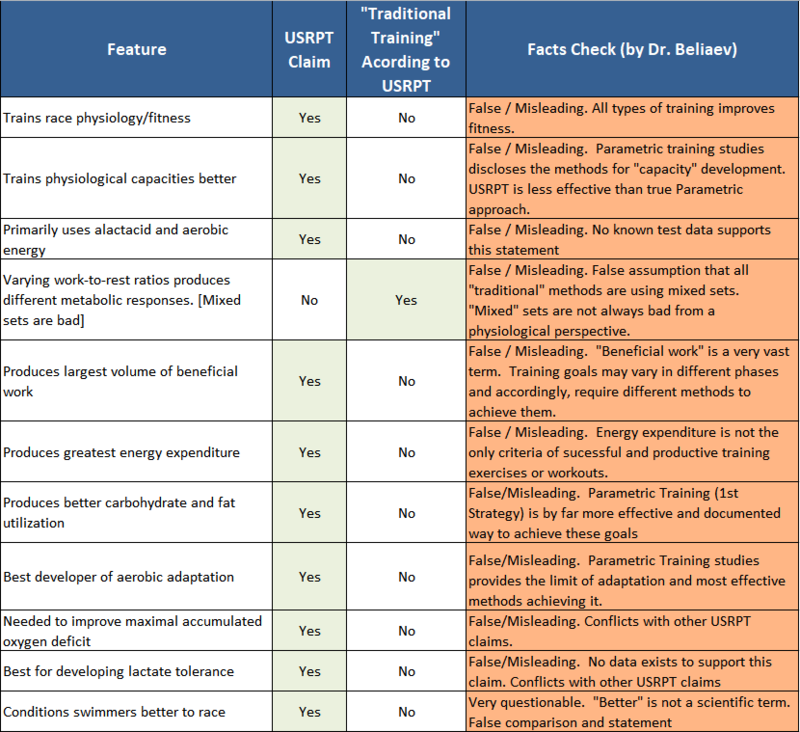 Because we continue to receive questions about the USRPT method, its effectiveness, and potential inclusion with the 3S platform, I decided to review and reprint the original article in an “author’s uncut” version with some corrections and more detailed explanations as was demanded by time. I do believe that my comments that were cut from the original publication, are important for proper understanding of the nature and effects of the USRPT method from a training methodology perspective, the field of sports science I personally devoted my life to since early 1980’s. I stand for every word and comment made in my article, and believe that my evaluation fairly explains the USRPT method for those who are looking for answers about the effects of this approach. Without a doubt the use of Ultra Short Race Pace Training (USRPT) has become one of the most hotly contested topics among swim coaches and master swimmers in recent years. Proponents of USRPT swear by it, and detractors warn sternly about its inherent long and short-term dangers. There are many glowing testimonials, and just as many warnings posted in blogs from coaches and swimmers who have used it. So what’s a coach to do, especially when the welfare of his athletes hangs in the balance? Although anecdotal evidence can be important, it’s time to clear the air with a more rigorous analysis based on physiology, exercise science, and the scientific discipline of training methodology. With that approach, we can eliminate the ballyhooing, name-calling, and scientific inaccuracies so rampant in this debate and give you enough factual evidence to actually make your own decision whether or not to use USRPT. USRPT is Dr. Brent Rushall’s brainchild, and he is a vigorous and vocal defender of his program. Virtually all of the scientific evidence he uses to back up USRPT comes from his own research, which he’s published in his own journal (“Swimming Science Bulletin”). From a sports scientist’s point of view, this lack of objectivity is a little hard to swallow. I would surely have expected to at least have seen some supporting research from a few noted exercise physiologists, but Dr. Rushall maintains that his program is “evidence-based”, an argument which is hard to swallow. “Evidence-based” term was first used by the medical community and in medicine, for example, is predicated on the conscientious, explicit, and judicious use of current best evidence in making decisions about the care of individual patients. Applying this definition to swimming would mean that a coach needs to personally decide which training strategy will work best for EACH of his athletes, choosing from training protocols that have consistently delivered positive effects on ALL (or at least the majority) of swimmers. Ironically, this argument can be applied to Super Sport Systems training protocols which are supported by decades of results, not mentioning the results of numerous studies. However, this is a far cry from developing a program, and then justifying its use with results from in-house undocumented research, like in case of USRPT. “Testimonials”, “anecdotes”, and even “results” (unless they are statistically significant) are simply not enough to “prove” anything. And since the science of training methodology just happens to have been my profession for the last 30 years, I am going to base my comments on our current understanding of training methodology and physiological reactions to “standard exercises”, as well as the competitive results of the 100,000+ athletes (age-groupers to Olympians) who’ve trained with us over the last 10 years. So what is USRPT anyway? In Dr. Rushall’s own words… it “is an evidence-based training program/stroke curriculum”. Well, as you saw earlier… it really isn’t evidence-based. And the author calls it a program, not a method or system, which his supporters claim it is. We’ll see why that’s so important a bit later in this discussion. If you dig deep enough into the training strategies incorporated in USRPT, they can easily be classified as a variation of Parametric Training. That concept and its application have been well-proven to be an extremely powerful and effective training tool when used under specific conditions and in appropriate training phases (S. Gordon et al, 1970 – 2010. 27 separate studies). Sets and their conditions are poorly defined in terms of how long athletes need to stay in specific training zones. Also in USRPT since the number of “effective” repetitions is not a known quantity, it is impossible to quantify the desired maximum adaptation effect. The suggested modality of executing sets is somewhat “hybrid”, mixing different parametric strategies together (e.g. increasing the number of “successful” repetitions in time on one hand, and increasing relative intensity/pace on the other). According to studies (S. Gordon, E. Starodubtseva, 2005) this actually reduces the final training effect that can be achieved. Moreover, increasing total training distance under ever-increasing relative intensity can easily lead to fast exhaustion of adaptation resources, which limits overall progress and the development of an athlete’s true potential. This does not occur when pace alone is held constant, as in true Parametric Training. Because USRPT is using Parametric training modality (albeit a distaff version), it can actually be effective for a limited time and to a limited extent, but only when applied as suggested (S. Beliaev; S. Gordon, M. Kredich). Once individual adaptation potential is saturated, you can expect to see “stagnation” (lack of progress or just reduced rate of progress). Actually, that is typically what happens in nearly all forms of race pace/ high-intensity training (parametric studies, exhaustive strategies, Gordon et al, 1972-2003). In reality though USRPT may actually favor some types of athletes, especially those with a higher distribution of fast twitch fibers in their muscles (i.e. “bright” sprinters). That will be especially true when training at lower than usual training volumes, but the long-term effect of using a training approach like this is very questionable and most likely short-lived, due to favoring just one color in the spectrum of an athlete’s preparation. Various studies suggest that prior distance-oriented training, especially in an athlete’s early development phases, contributes to his ability to reach individual maximum results at a later age (e.g. A. Vorontsoff, 2000). Many coaches and swimmers mistakenly believe that USRPT is a training “system”, but it lacks sufficient structure and organization to be classified that way, which I surmise is why Rushall himself calls it a “program”. And it isn’t a “method” either. Since there really is no scientific basis underlying its suggested course of action, or precise definition of training components, it cannot control the training process or its outcome with any degree of certainty or precision. How valid are their claims? When these claims and comparisons are examined in depth, most are found to be at best only “partially true”, while a few are simply misleading. The reality of the situation is that any form of training conditions athletes to perform better, and covers most of the factors mentioned in this self-promoting endorsement, rendering this “table of comparative effectiveness” totally useless. Well then, what can we believe? For instance is there any truth in USRPT’s claim that it is “best for developing power”? Actually, we would find it hard to agree with that, since the method itself is inappropriate for power maximization. The facts are… interval training modality, especially with a large number of repetitions (6-8 or more), is hardly appropriate for developing maximal power as a rule. Actually, the parametric training modality (which USRPT uses) is well-known for being the best way to develop “capacity” at a given level of power output. On the other hand, if we were to believe for an instant that USRPT could indeed be “the” way to achieve maximum power, that would conflict with their “core claim”… that at no time do athletes reach levels of exhaustion close to VO2 max. In order to maximize “power” we need to proceed to a repetitive modality with few repetitions close to full out effort, and plenty of rest in between them to allow for a comfortable recovery. This type of effort, especially with the time of each rep close to 30 seconds, leads to very high levels of lactate in the blood, and is usually chosen to develop “anaerobic” power. But the range of improvement in that department is usually associated with an athlete’s level of aerobic capacity and individual lactate tolerance limits. Certain other factors contribute to this as well. While it is true that excessive development of aerobic training prohibits anaerobic power development (J. Olbrecht, 2000), the separation of training by season phases helps to mitigate that issue. Additionally, the time required to reach peak anaerobic power is also quite short… typically only 4-6 weeks. It is also important to remember that the level of improvement in speed is limited by the level of development of other abilities (Verchoshansky, 1988, Volkov, 1991, Gordon, 2005). In other words, speed on our main distance depends on the level of performance on ALL distances (Gordon, 2008). Additionally, the power an athlete can achieve on his main distance correlates with his current aerobic capacity levels as well. It is true that swimming at fast (race) paces with a large number of repetitions will surely tax an athlete’s anaerobic capacity in a positive direction, resulting in almost immediate improvement in that department as well as his race performance. However, these changes are short-lived and require a total reset of the training cycle after the athlete reaches saturation, which unfortunately is inevitable. That is one of the reasons USRPT followers have mixed results. Can it be avoided? Sure, if you include other necessary components of preparation in the training process and properly position them over time according to the season phase. Is it really all that different? According to Dr. Rushall, the periodization model used in USRPT is different from the “classic” approach most coaches still use (L. Matveev, 1968 – 1977, T. Bompa, 1973 – 1999). That is actually very important and quite desirable, since Parametric Training strategies work best when training stimuli are adequate to individual adaptation threshold at any given time (S. Gordon, 2005-2008, Beliaev, 2010). Once you embrace this way of thinking, you may find that new training method, USRPT included, require a rethinking of your approaches to Periodization. The author of USRPT himself believes that “high-Intensity training methods deny ‘Principle of Pendulum’ (Stress – Recovery – Stress), the main principle of conventional periodization theory”. Now that’s something we can agree with whole-heartedly. Including recovery days and periods in its protocols suggests that “overload” still plays a significant role in achieving desired adaptation. So in that sense USRPT, as yet another race pace training method, is very similar to other high intensity/short effort training protocols (D. Pendergast et al, V. Selyanov, Tabatha et al) and shares the same long-term limitations observed in this category. Then what can it do? Some coaches believe USRPT is the best way to develop aerobic capacity, but we can’t find evidence to support that… especially when compared to the results you can achieve with pure first parametric training strategy. This is because USRPT mixes increased total set distance with increased pace over time… another recipe for lost potential. Maintaining the “principle of specificity” is a lynchpin of USRPT, where specificity is defined as the need to swim at race paces all the time. But the commonly used interpretation of that term means something quite different. It is generally accepted that for an athlete to achieve better results he needs to specialize and train in a selected activity or single sport, without reference to its intensity, though studies Rink, J.E. (1985), support the idea that learning skills at desired speed can be beneficial. But USRPT author takes that notion to an extreme level, and in doing that actually violates the “principle of skills acquisition”. Accordingly, in order to control a specific movement pattern an athlete needs to possess cognitive understanding of all of its elements. Learning skills and their elements work best by starting with separate movements, allowing full control over its quality. But control at initial phases when movements (strokes) are being learned is hard to do under high intensity/fast swim conditions. Ideally, we learn to control the quality of each movement gradually, with a gradual increase of intensity. And while it is generally true that requirements of technical skills can be different at different paces, attaining proper technique at different speeds is still a gradual process, which is why we start executing various stroke elements at low speeds. It is a known fact that any structured training program is more effective than an unstructured one. USRPT is a “semi-structured” training program that focuses on just one out of at least 4 of the elements needed to prepare an athlete for competition. Yes, it can be effective in the short-term, especially when coming from a poorly designed or unstructured program. But I would argue that this method is not as effective as other well designed or, even better, optimized training programs in either the short or long haul. USRPT makes many claims that just sound right to a person who is not very familiar with the laws of human adaptation, or exercise physiology. But once you start checking under the hood, the “miracle effects” attributed to this program, don’t seem to have any real substance behind them, and seem questionable at the very least. In the final analysis, the format provided by USRPT does not allow for intelligent management of all the factors that influence adaptation progression. Therefore, as a tool it lacks the precision coaches need to train their athletes predictably, effectively and efficiently. And without that there is no way for an athlete to develop his true potential. Sorry… but in our opinion, USRPT is long on promise, short on delivery, and just too dangerous a weapon to be used across the board. I agree with you , very good article Sergei !! !